A. de Ruiter, “Observer-Based Spacecraft Attitude Tracking with Guaranteed Performance Bounds”, American Control Conference, Chicago, IL, July 2015. A. de Ruiter, “SO(3)-Constrained Kalman Filtering with Application to Attitude Estimation”, American Control Conference, Portland, Oregon, June 2014. E.J. Findlay, J.R. Forbes, H.H.T. Liu, A. de Ruiter, C.J. Damaren, J. Lee, “Investigation of Active Vibration Suppression of a Flexible Satellite using Magnetic Attitude Control”, AIAA Guidance, Navigation and Control Conference, Portland, Oregon, August 2011. A. de Ruiter, J. Lee, A. Ng, C. Lambert, J-F. Hamel, J. de Lafontaine and B. Shankar, “Overview of Japan Canada Joint Collaboration Satellites (JC2Sat) GNC Challenges and Design”, AIAA Guidance, Navigation and Control Conference, Toronto, Canada, August 2010. A. de Ruiter, J. Lee and A. Ng, “A Fault Tolerant Magnetic Spin Stabilizing Controller for the JC2Sat-FF Mission,” Proceedings of 2008 Guidance, Navigation and Control Conference, Honolulu, Hawaii, 18-21 August 2008. B.S. Kumar, A. Ng, K. Yoshihara, A. de Ruiter, “Differential Drag as a Means of Spacecraft Formation Control,” 2007 IEEE Aerospace Conference, Big Sky, Montana, 3-10 March, 2007. A.H.J. de Ruiter, and H.H.T. Liu, “Decoupled Controller Design for One-Way Coupled Systems – A State-Space Approach,” 2004 AIAA Guidance, Navigation, and Control Conference, Providence, Rhode-Island, August 16-19, 2004. A.H.J. de Ruiter and H.H.T. Liu, “A Systematic Controller Design Procedure for One-Way Coupled Systems,” 2004 AIAA Guidance, Navigation, and Control Conference, Providence, Rhode-Island, August 16-19, 2004. A.H.J. de Ruiter and H.H.T. Liu, “Control Design Decoupling for Two-Way Coupled Systems,” 2004 IEEE Conference on Control Applications, Taipei, Taiwan, September 2-4, 2004. A.H.J. de Ruiter and H.H.T. Liu, “Integrated Multiple Objective Controller Design for One-Way Coupled Systems,” Proc. 2003 American Control Conference, Denver, Colorado, June 4-6, 2003. H.T. Liu, D. Harman and A. de Ruiter, “Real-Time Flight Control in an Emergency Landing: Sampling Rate Considerations,” Proc. 2003 AIAA Guidance, Navigation, and Control Conference, Austin, Texas, August 11-14, 2003. A.H.J. de Ruiter and C.J. Damaren, “Effect of Attitude Parameterization on the Performance of Passivity-Based Adaptive Attitude Control,” Proc. 2001 AIAA Guidance, Navigation, and Control Conference, Montreal, Canada, August 6-9, 2001. W. Soh, J. Michels, D. Asquin, A. Vigneron, A. de Ruiter, R. Buckingham, “Onboard Navigation for the Canadian Polar Communications and Weather Satellite in Tundra Orbit”, Proceedings of the International Astronautical Congress, Toronto, Canada, September 29–October 3, 2014. S. Lee, H.M. Yang, A. de Ruiter, “Performance Analysis and Improvement on the Existing Ground Station for JC2SAT Mission,” Proceedings of The Institute of Electronics Engineers of Korea, 6, 2014, pp. 458–461. 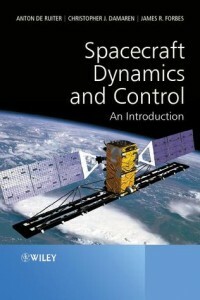 A. Frias, K. Kumar, A. de Ruiter, “Robust Nonlinear Control of Underactuated Spacecraft Using a Single Thruster”, Proceedings of the International Astronautical Congress, Toronto, Canada, September 29–October 3, 2014. R. Hewitt, A. Ellery, A. de Ruiter , “Efficient Navigation and Mapping Techniques for the Kapvik Analogue Micro-Rover”, Proceedings of the Global Space Exploration Conference, Washington, D.C., U.S.A., 2012. R. Hewitt, A. Ellery, A. de Ruiter, “FastSLAM on a Planetary Micro-rover Prototype, Proc. CASI ASTRO 2012 Conference, Quebec City, April 24–26, 2012. J.-F. Hamel, A. St-Amour, J. de Lafontaine, J. Lee, C. Lambert, A. Ng, A. de Ruiter, “Overview of JC2Sat-FF Guidance, Navigation and Control Architecture, 4th International Symposium on Formation Flying, Missions and Technologies”, CSA St-Hubert, Quebec, Canada, 18–20 May, 2011. E.J. Findlay, H.H.T. Liu, A. de Ruiter, C.J. Damaren, J.R. Forbes, J. Lee, “Investigation of Satellite Flexibility due to Increased Drag Panel Area for Differential Drag Formation Flying”, 4th International Symposium on Formation Flying, Missions and Technologies, CSA St-Hubert, Quebec, Canada, 18–20 May, 2011. J. Lee, A. de Ruiter, A. Ng, C. Lambert, Y. Kim, K. Yoshihara, “Attitude Determination and Control Subsystem of JC2SAT-FF Mission”, 12th International Space Conference of Pacific-Basin Societies, Montreal, Quebec, Canada, 27–30 July, 2010. A. de Ruiter, M. van Mierlo, J. Lee, S. Martins, A. Ng, K. Yoshihara, “A ”Power Positive Parking” Attitude Mode with a Fault-Tolerant Magnetic Spin Stabilizing Controller for the JC2Sat Mission,” Proceedings of 27th International Symposium on Space Technology and Science, Japan, July 5–12, 2009. A. de Ruiter, J. Lee, and A. Ng, “A Fault Tolerant Magnetic Bias Momentum Control Law,” Proceedings of 3rd CSA-IAA Conference on Advanced Space Systems and Applications, Shanghai, China, 29 Oct – 1 Nov 2008. K. Yoshihara, M. van Mierlo, A. Ng, B. Shankar Kumar, A. de Ruiter, Y. Komatsu, H. Horiguchi, and H. Hashimoto, “JC2Sat-FF: An International Collaboration Nano-Sat Project – Overview of the System Analyses and Design,” The 4S Symposium, Rhodes, Greece, 26–30 May 2008. A. de Ruiter, A. Ng and J. Lee, “Orbit Propagation and Relative Positioning Techniques for JC2Sat,” 3rd International Symposium on Formation Flying, Missions and Technologies, ESA/ESTEC Noordwijk, The Netherlands, 23–25 April, 2008. K. Yoshihara, T. Yamamoto, Y. Kondoh, H. Hashimoto, A. Ng, A. de Ruiter, J. Lee, “Performance Assessment of Single and Dual Frequency, Commercial-Based GPS Receivers for LEO Orbit,” 21st Annual Conference on Small Satellites, Utah State University, Logan, Utah, 13–16 August 2007. A. Ng, K. Yoshihara, H. Hashimoto, L. Ngo-Phong, B.S. Kumar, A. de Ruiter, “Nanosatellite Mission for Demonstrating Formation Keeping Technology with Aerodynamic Drag,” 11th International Space Conference of Pacific-basin Societies, Beijing, China, 16–18 May, 2007. H.H.T. Liu and A. de Ruiter, ”Control Integration Process in Aircraft Systems Development,” Proceedings of the 23rd International Congress of Aeronautical Sciences (ICAS), Toronto, Canada, September 8–13, 2002, ICAS 2002-R37. A. de Ruiter and C. Damaren, “Extended Kalman Filtering and Nonlinear Predictive Filtering for Spacecraft Attitude Determination,” Proc. CASI ASTRO 2000 Conference, Ottawa, November 7–9, 2000.